Sorority communications platform MyChapterRoom (MCR) launches a new Mobile App featuring Event Check-In that makes taking attendance a breeze on an iPhone or Android smartphone or tablet. MyChapterRoom Mobile App is available to MCR members on iPhone and Andoid. The new MyChapterRoom Mobile App features scannable Event Check-In functionality that makes taking attendance at sorority events fast and easy! 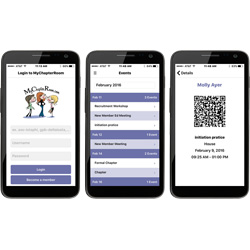 MyChapterRoom (MCR), the only communication system designed specifically for the needs of a sorority, announces the release of its new Mobile app featuring scannable Event Check-In functionality that makes taking attendance fast and easy. The app makes it easy for attendees to pull up a unique QR code on their iPhone or Android smartphone that the chapter leader easily scans using a smartphone or tablet. After a quick verification of the attendee, the chapter leader simply presses a button to enter the information directly into MCR. The Event Check-In simplifies the attendance taking process for both the sorority members and the chapter leader. The new MyChapterRoom Mobile app is available for download from the iPhone App Store and Google Play Store to MCR members that have their login information. Sororities that are not yet members of MCR are invited to take advantage of the special 60 day free trial offer that gives them full access to the communications system free of charge. Access includes all the tools and features a sorority needs, including secure login with multiple levels of access, a dynamic calendar, excuse forms, a customized incentive program, customizable external website, secure group chat, MCR Mail, customizable message board, polling, sign ups, secure document sharing and the ability to download the new mobile app with Event Check-In. For more information about MyChapterRoom, the new mobile app with Event Check-In, and the full access 60 day free trial offer, visit mychapterroom.com/mcr-solution/chapters/. Sorority organizations exploring the benefits of a single, fully integrated communications platform can learn more about the free pilot program for organizations that provides a no risk opportunity to try the system. MyChapterRoom (MCR) is the only sorority communications system designed by a sorority woman specifically for the needs of a sorority. Developed by Founder & CEO linkedin.com/in/pennyzamkov to empower chapters and their organizations to communicate effectively with their members, MCR features a suite of secure, customizable communication tools and a mobile app that serve the unique needs of a sorority throughout their members’ lifetime. Visit http://www.mychapterroom.com. MyChapterRoom - taking sororities to a new level of communication!